Prime Minister Dr. the Honourable Timothy Harris and a contingent from St. Kitts and Nevis will be in attendance. Yesterday, Prime Minister Harris met with family members of the late Brian Pacquette. Attached are two photos that were taken after the successful meeting. 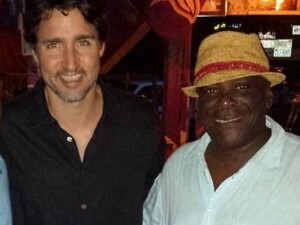 While in Dominica, Dr. Harris took the opportunity to meet with his prime ministerial colleague. This morning, the Prime Minister of St. Kitts and Nevis, Dr. the Honourable Timothy Harris, met with the Prime Minister of Dominica, the Honourable Roosevelt Skerrit. They discussed bilateral issues, as well as issues at the regional level such as matters to do with LIAT and the Regional Security System (RSS). With effect from April 1st, 2016, the Prime Minister of St. Kitts and Nevis assumed the chairmanship of the Council of Ministers that oversees theRSS. The chairmanship rotates on an annual basis, so Dr. Harris will chair the RSS up to March 31st, 2017. The Council of Ministers comprises Government Ministers who have responsibility for the national security portfolio in each of the seven RSS member states (Antigua and Barbuda, Barbados, Dominica, Grenada, St. Kitts and Nevis, St. Lucia, St. Vincent and the Grenadines). On July 1st, 2016, the Prime Minister of Dominica assumed the Chairmanship of the Conference of CARICOM Heads of Government for the period up to December 31st, 2016. The Conference of Heads of Government is the supreme organ of the Caribbean Community and comprises the Heads of Government of the Member States. This man was a small man but a big giant. He was a great young man. The short time I he with with when he join the force. It was a privilege. God Bless. Castile’s family hired Hatchett, best known as a television court-show judge. She says she won’t rely on the state’s investigation to proceed with a lawsuit against Yanez. But a police spokesman says there’s no indication that the early Tuesday incident was a “planned attack on police.” No injuries were reported.